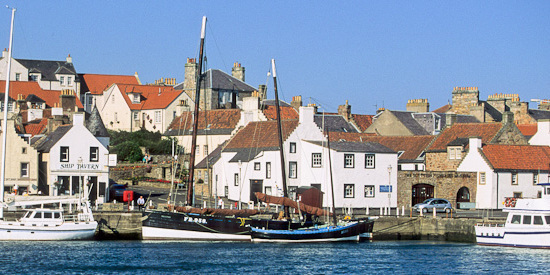 Rachel is hesitant to return to Gandiegow, Scotland, but does so for the sake of her daughter. It does take long for Rachel to bump into her husband's cousin - the one man who took her breath away on her own wedding day. Still, it was important for Rachel to bring her daughter to the Scottish fishing village so she could meet her paternal relatives. Fate gives Rachel the opportunity to not only relive the painful memories of her wedding day but follow her heart for everlasting love. 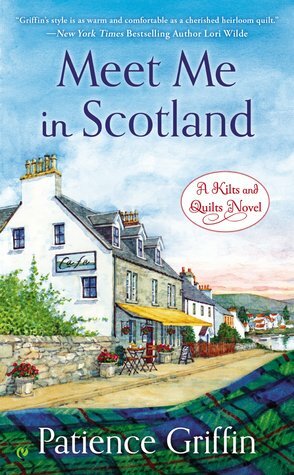 IT HAPPENED IN SCOTLAND is a second chance romance embedded in small town romance topped with Scottish culture and quilting metaphors. 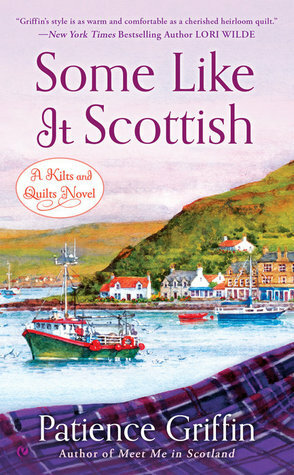 IT HAPPENED IN SCOTLAND is Book Six in Griffin's Kilts and Quilts series - characters from previous novel contribute to the fishing village's second industry, the quilting retreat. 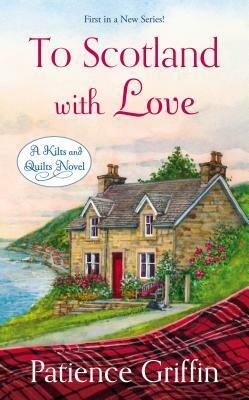 While I am not quilter, I appreciated how the quilting squares - representing each villager - are sewn together for a strong community and a compelling read.. Griffin has a knack for creating "comforting" romances akin to snuggling under a handmade quilt. Likewise, Griffin offers the escape to Scotland. Sigh. Alba. IT HAPPENED IN SCOTLAND was published on January 3, 2017, by Berkley, making it the first keeper of the new year. Learn more about Patience and her books at patiencegriffin.com. 1. Leave a comment about quilts - do you have any? I have three quilts - one for my wedding and one for each child - hand made by my husband's childhood piano teacher. Cathy has since past away so the quilts are now a tribute to her kind heart. They are so beautiful that we hang them rather than use them. 2. Comments are open through Sunday, January 8, 10 pm in Baltimore. 3. I'll post the winner on Monday, January 9. I have several quilts. My grandmother worked in a shirt factory and got scrap material. She made plain, serviceable quilts for her 7 children. They were just 6 inch squares and the quilt was tacked, not sewn. I have 2 of those. I do have a small quilt she made for the cradle. It has squares she embroidered and the quilting is done on the joining of the squares. I have gotten several at auctions. One is a crazy quilt made from dark velvets. My favorite is a quilt that is white with rows of two inch squares running the length of it. The squares are obviously from dresses. The rows take up very little space. Most of the quilt is white. What makes it special is the incredible white work stitching. The quilt fits a double bed and is covered with detailed stitched work. The stitches are impossibly even. It only cost me $3 or $5. We have other serviceable quilts and parts of some that have been loved to pieces. I was lucky enough to talk with Patience Griffin at a reader's and writer's conference. She is personable and delightful to visit with. I wish I had some beautiful heirloom quilts, but alas!! I only have one quilt that was made for one of my children many years ago. But I would love to make them myself. I also love this series. I had a handmade quilt but I never use it.....I want to save it. My husband's grandmother made a quilt for each of her grandchildren. Lovely white & yellow. No, I'm afraid I don't. I do have some afghans though that have been passed down. I have one that my brother-in-law gave me that was made by my grandmother. I lost my sister last y ear and this is a memory of both. I have quite a few quilts since my mother in law is a local famous quilter. I have two on my bed - one my hubby's childhood quilt and one our wedding quilt - then each of the 4 kids has one, also she has made me lap quilts and the such. I love every one of them! We just have the small crocheted blankets i make for babies we have no homemade quilts as i am disabled and not able to make them plus husband is laid off till April so no money coming in yet from unemployment . We have 3 quilts that my husband's grandma made for us. My grandmother made my children small quilts when they were babies. I have two quilts, one from my mother's with many fabrics from clothes she made me growing up, and one from a favorite aunt. I have one quilt, which was made by a friend. I do so admire those who patiently piece together these fabric works of art. I have a lot of quilts, my grandma was a quilter and so was my MIL. I have more quilts than most people I know. I even have two double wedding ring quilts made by my grandma. I love quilts. I make quilts all the time and give them to charity in our state. We don't have any quilts. My stepmother is a quilter, so I have a couple of lap quilts made by her. I also have purchased larger quilts for my bed. I have 2 quilts. One made by each of my grandmothers. I have one quilt -- I made it for my first daughter many years ago. 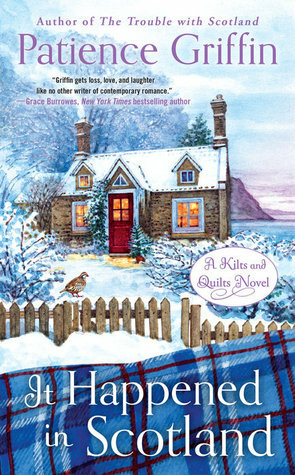 I love Patience Griffin and the Kilts and Quilts series! I have two quilts - one from my Grammy that I got on my wedding and one from Patience! I'm listening to It Happened in Scotland right now as I type this. Love it!